The Skyline Plaza Garden, in the heart of Frankfurt, Germany is a roof top haven for just about any outdoor hobbyist. Completed by landscape architects Mahan Rykiel and Associates (MRA) from Maryland, the project just opened atop a large shopping mall. At almost twice the size of a football field, the plaza boasts a host of amenities from a performance venue to a vineyard to a putting green and even table tennis courts. If patrons work up an appetite, they can simply pop into one of the two restaurants to fuel up. 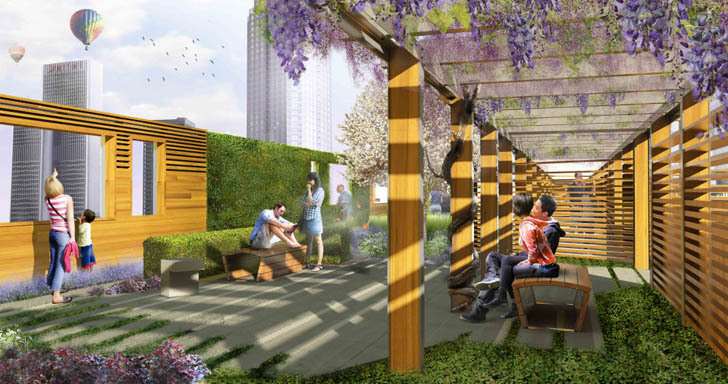 Active spaces are divided by a network of paths that create areas for complimentary gardens. If Frankfurters need serenity, but don’t have time to leave the city, they can enjoy Yoga or Tai Chi or stroll through the vineyard. Did we mention there is a rooftop Vineyard? 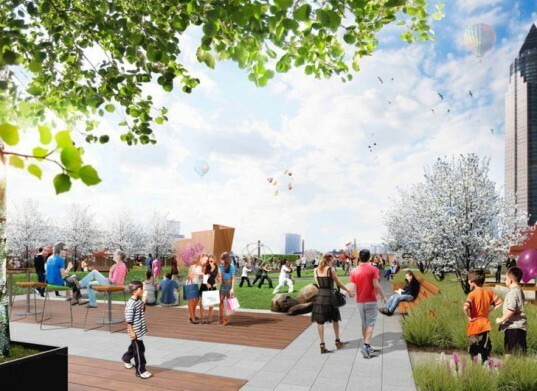 The project team sees this development as an urban gathering space; recognized for its integration into the urban landscape, there will also be a subway station within the mall. Sustainability played a significant role in this development, not only within the broader context, but also throughout the project itself. The German Sustainable Building Council has already awarded it a gold pre-certificate. One of the most notable measures is the 70,000 gallon cistern that will store rainwater for irrigation. MRA has given special care to vegetation selection and placement to most effectively manage storm water runoff. Dense vegetation such as Pine, Himalayan Birch and Sycamore trees will create a healthy, comfortable micro-climate for Skyline Plaza patrons. This project has many firsts for Germany and there seems to be a great deal of excitement around its opening. If you’re lucky enough to be living or traveling in there, let us know how it is! Active spaces are divided by a network of paths that create areas for complimentary gardens. If Frankfurters need serenity but don't have time to leave the city, they can enjoy yoga or Tai Chi or stroll through the vineyard. The project team sees this development as an urban gathering space; recognized for its integration into the urban landscape, there will be a subway station within the mall. Sustainability played a significant role in this development, not only within the broader context, but also throughout the project itself. The German Sustainable Building Council has already awarded it a gold pre-certificate. One of the most notable measures is the 70,000 gallon cistern that will store rainwater for irrigation. MRA has given special care to vegetation selection and placement to most effectively manage storm water runoff.